When I came across Chunky Mark’s (aka the Artist Taxi Driver) three hour youtube upload entitled “JEZZA the movie 2018” I was intrigued. Three hours later I was impressed: it had really felt like three hours well spent. In truth I paused a few times during the three hours – there’s a lot to take in and some sequences are a little slack, which is only to be expected. Judged fairly, this is a fine piece of amateur filmmaking: sensitive, constantly thought-provoking, and in parts hilarious. Though it will not win any Golden Globes, it deserves an audience, which is why I am recommending it. Oh, and at one point I stopped for about half an hour to gaze out of my bedroom window over the rooftops and the gardens, watching as fireworks lit up the Sheffield sky welcoming in the New Year. The annual people’s firework display (as I regard it) is one recent tradition I look forward to. How different from our long-established Bonfire Night which goes on and on for days and means what? Why do we celebrate the uncovering of the so-called ‘gunpowder plot’ to blow up parliament by detonating lots of mini explosives? Yet it feels right that we celebrate something as arbitrary and ephemeral as the passing of the minute hand at the start of every year with such a nonsensical flurry of sound and fury. Countless individuals in countless backyards lighting blue touch papers that launch into one glorious, synchronised citywide spectacular. Reflecting upon the moment of yearly rebirth can feel a bit like pinching yourself; uncannily becoming aware of the thing you are forever forgetting. Not merely another year passing and I am still here, but right now I am here. And in a way Chunky Mark’s review is a gentle slap to our political consciousness (whereas most other annual reviews are to entertain and distract). His appraisal of Britain’s mounting social problems is unsettling, but there is constant encouragement too. It is not so much a homage to the Labour leader as a heartfelt tribute to grassroots activism. You can read more about him in this Guardian review by Dawn Foster published in January 2015.
taking stock of Corbyn’s heroic election campaign — what’s the opposite to a Pyrrhic victory? The image above is a screenshot of the wikipedia entry for “moral victory” as it appears at present. As you can see, presented as examples of “the opposite of a Pyrrhic victory” it lists just three: The Alamo, the Battle of Thermopylae and the United Kingdom 2017 General Election! In short, Corbyn has proved himself the most popular Labour leader with the electorate in more than 40 years, apart from Blair’s landslide victory in 1997. Here is a graph that offers another measure of the extent of Corbyn’s achievement last night. 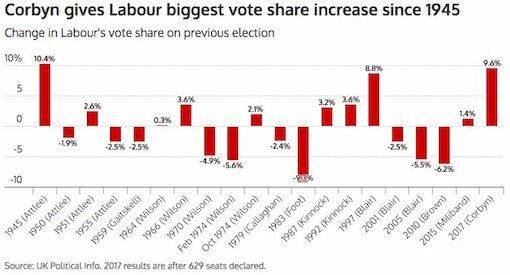 It shows that he has just won the largest increase in the share of the Labour vote over the party’s previous general election performance since Clement Attlee in 1945. In short, he’s turned around the electoral fortunes of the Labour party more than any other party leader in 70 years. And unlike Blair, he’s done it without making back-room deals with big business to eviscerate his party’s economic and social programmes. When May called the snap General Election on April 18th, she and her Conservative Party were riding high in the polls with a twenty point lead. In office for just nine months, she had been hastily crowned Prime Minister after Cameron fell on his sword in the wake of his own humiliating EU referendum defeat, but quite wisely afterwards had kept a mostly low profile. In this way, and with her oft-repeated pledge to honour the pro-Brexit result, May cultivated the appearance of reliability and toughness – she was Thatcher 2.0 but with a more daring wardrobe. “Brexit means Brexit” is almost as nebulous as it is defiant, but the Tory’s tiresome mantra was also serving May’s purposes well. Her image as a “bloody difficult woman” given an extra boost thanks to Jean-Claude Junker’s odd cameo at Downing Street right on cue as the campaign got underway: their reportedly “frosty dinner” doing little to dent the popular belief that May was a safe pair of hands. On the other hand, May’s call for a needless election did open up a small chink in her otherwise shining armour. For having repeatedly assured the nation she would do no such thing, this act was literally the only moment she’d dropped her guard since becoming PM. Her campaign underway, May now resolved to basically disappear from sight. Shirking the TV debates, placing unprecedented restraints on press access, and avoiding all but the most fleeting encounters with the hoi polloi, her strategy was one of total control. Although this quiet contempt for democracy was not going to pass unnoticed. By contrast, the Labour Party was forced into the campaign when already in complete disarray. Seldom mentioned, the polls had in fact narrowed considerably twelve months earlier during the run up to the referendum vote, and also immediately after Cameron’s defeat (see above), yet the Blairites wasted no time undermining Corbyn on the grounds of his lacklustre performance stumping for the “remain” campaign. Since it suited their purpose, they simply ignored what the polls were actually telling them, and seized on this flimsiest of excuses to stir the pot a whole lot more in the hope of finally deposing the leadership. Former leader Neil Kinnock was perhaps first up, delivering what the Guardian soon afterwards reported as “a remarkable speech” to the Parliamentary Labour Party (PLP). Now that is unfortunate. But you know. Everybody in this room knows, canvassing in the Welsh elections, in the Scottish elections, in the local elections, in the referendum – you know that is what you’re getting from people who yearn to vote Labour but are inhibited by the fact that Jeremy is still our leader. Neil Kinnock is famously unelectable, of course, so I suppose we ought to marvel at the sheer brass neck of the man. His “we’re all right” Sheffield debacle was the single most excruciating misjudgement made by any Labour leader since Jim Callaghan’s “Waiting at the Church” moment of hubris. However, Lord Kinnock has certainly done all right – at least for himself – since those formative hiccoughs: appointed to the European Commission in 1995, then rapidly promoted to Vice-President in 1999, and awarded a life peerage in 2005. Wife Glenys ploughed a similar furrow, becoming an MEP in 1994 and receiving her own life peerage in 2009, whilst son, Stephen, a current Labour MP and another uninhibited Corbyn critic, is married to Helle Thorning-Schmidt, a former MEP herself before becoming Danish PM. The Kinnocks have built a tidy little empire for themselves. The referendum campaign was a sorry affair and it’s clear that it was not the Labour party’s finest hour. Every pro-Remain member will be feeling the same deep sense of disappointment and regret that I am feeling this weekend, as we have failed, collectively, to save the UK from a reckless leap into the unknown, and we fear it is the people we came into politics to represent who will be hurt first and worst. Looking back, it’s clear that once the Scottish, Welsh and local elections were out of the way on 6 May , then we should have treated the period through to 23 June as if it were the short campaign period leading up to a general election. Judged against that benchmark, it is equally clear that our leader fought a lacklustre and half-hearted campaign. He spoke at a total of 10 rallies between 6 May and polling day, whereas the party leader would normally expect to achieve that level of activity in a week, when in full campaigning mode. We must, therefore, have a full and frank discussion when the parliamentary Labour party meets on Monday, to look at what went wrong, and what we should learn. Our leader must be held accountable for the failure of the “Labour In For Britain” campaign, as must we all. We may have no say over who the Tories send to the negotiating table, but we do have a say about who Labour sends. Jeremy Corbyn is a seasoned and highly effective campaigner, and he was elected to lead our party on the basis of a thumping mandate. But that was then and this is now. Now should not be about the past. The British people have spoken, the decision is made, and we must look forward. British politics is going to be dominated by these Brexit negotiations for the foreseeable future. It is vital that Labour has a seat at the top table, and critical that we have a leader who has the right experience and skills for the task at hand. But the Tory attacks could wait. During the notorious post-referendum ‘chicken coup’, no less than 44 frontbench Labour MPs resigned their positions in as many hours.3 Alongside Stephen Kinnock, leading lights of this suicidal insurrection included Deputy Leader Tom Watson, Angela Eagle, about-to-be leadership challenger Owen Smith, and then-Shadow Foreign Secretary Hilary Benn – reluctantly sacked by Corbyn before he had chance to resign. Each of the above publicly declared their loss of confidence in the leadership: a transparently lame excuse given how the self-same “rebels” had shown no loyalty whatsoever during any earlier stage of Corbyn’s brief tenure. When the PLP balloted for a vote of no confidence a few hours later, it was passed by a truly astounding 172–40: but it remained a vote which as Corbyn correctly asserted had “no constitutional legitimacy”. Nevertheless, the stage was set, and for the next three months the party tore into itself as it entered the throes of a hugely divisive and unwarranted leadership election. Inevitably, this infighting took its toll. Labour support tumbled in the polls, as did support for Corbyn’s leadership. Unsurprisingly, salt was liberally rubbed into these same gaping and self-inflicted wounds by both the Tories and the media alike, who cultivated the opinion already expressed by 80% of Labour MPs, that Corbyn – freshly re-elected as party leader – was in fact “unelectable”. Click here to watch a montage put together by Channel 4 News featuring senior Labour MPs (including Stephen Kinnock again) who publicly excoriated Jeremy Corbyn as party leader. What more evidence do they need? What more proof do the Labour leadership and its supporters require? This was not an opinion poll. This was not a judgment delivered by the hated mainstream media. This was the verdict of the electorate, expressed through the ballot box, and it could scarcely have been clearer – or more damning. The headline figure is a projected national share of 27%, the worst recorded by an opposition since the BBC started making such calculations in 1981. The Tory lead of 11 percentage points is larger than the one Margaret Thatcher enjoyed as she headed into the elections of 1983 or 1987, when she won triple-figure landslides. The good news for Labour is that what I saw in the focus groups were people unimpressed by the Tories, desperate for an opposition and itching to vote Labour again if only Corbyn would get out of the way. It suggests a new leader could take the fight to Theresa May very rapidly. The bad news is that once people have broken a lifelong Labour habit – and shattered a taboo by voting Tory – they may never come back. [P]oliticians and pollsters alike did not see this coming. But nor did most pundits – including me. I opposed Jeremy Corbyn when he first stood for the Labour leadership in 2015, and thereafter, and I did so on two grounds. First, on principle: I was troubled by his foreign policy worldview, with its indulgence of assorted authoritarian regimes, and by what I perceived as his willingness to look past antisemitism on the left. But more immediate was an assessment of his basic electability. I wanted the Tories gone, and simply did not believe Labour could pose a serious electoral threat under Corbyn. 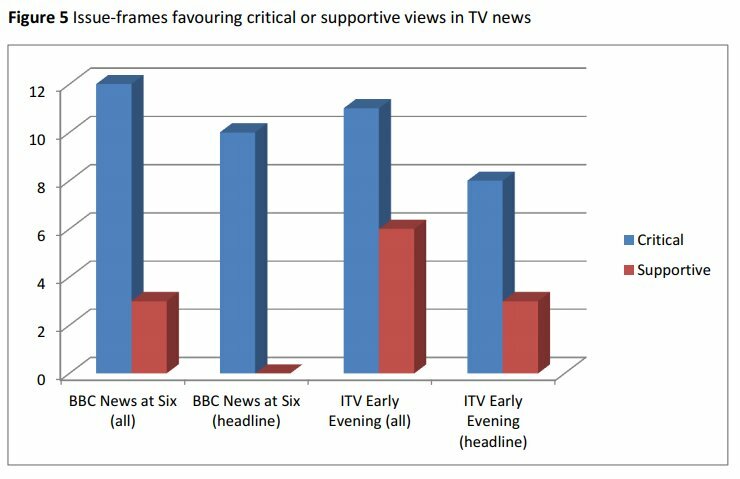 So please allow me to briefly digress, because today’s media, so narcissistically in love with its own reflection, has become the very definition of an echo chamber: newspaper headlines are a mainstay of TV debate and what is broadcast on TV and radio then siphons back into the newspapers. Additionally, there is increasing reliance on so-called vox pops: phoney snapshots of public opinion, meticulously edited into tidy bundles of required thought. Cheap to produce, they maintain the delusion that media is representative of what people like you and me actually think. In reality, of course, ordinary Joes and Joannas are commandeered to provide off-beam refractions simply to bolster a prefabricated message: Obama is cool; May is serious; Trump is an idiot; and Corbyn is hopeless. For months on end, the mention of Corbyn elicited titters from the commentariat alongside the required level of derision from the (assiduously selected) ‘man on the street’. Likewise, without fail, each week an audience member on the BBC Question Time would prime the panel with one of those tired old questions about his “unelectability” or the purported “lack of any effective opposition”. Thus, Corbyn was roasted on all sides: by media hacks and politicians from every camp, including nominally his own colleagues. But then, with the election called, this changed. Legal requirements would ensure some better measure of balance in the debate. Thus, with the playing field abruptly if only partially levelled (our right-wing newspapers are free from such constraints), Corbyn got the chance he’d been waiting for: able at last to make the case for a fairer and more caring society and not to be instantly drowned out by the clamour of critics. “I am a treat” my friend said as I pointed out the large black billboard ahead. His unconscious was momentarily getting the better of him and suggestively reworking the slogan to ensure it was functioning as ads generally do: as promotions for a product. But instead, this image, one I had walked past daily for almost a week, with its Big Sister portrait of May – former Home Secretary behind the Snooper’s Charter – sternly peering out like a stony-hearted headmistress, was issuing the country an exceedingly stark but fair warning. Put together by anti-austerity campaign group the People’s Assembly, its message was bleak yet factual and accurate. It branded May a threat to our hospitals, our schools, our job security, our pensions and our peace and security. And who could deny any of it? In fact this portent of doom had only recently replaced another. The face of Donald Trump and around it the words “Advertising works… look what it did for me”, but now with a toothbrush moustache inked above those all-too familiar pouting, foul-mouthed lips. Soon afterwards the same billboard had been further subverted when someone had the wherewithal to scrub over ‘advertising’ and substitute a far more appropriate four-lettered word: ‘HATE’ in block capitals. Yes, I mused philosophically, as I passed under it each day… hate does indeed ‘work’ in a political sense. Also take a close look at the graph above and see how the convergence between the Labour and Conservative polling slows directly after the Manchester atrocity on May 22nd. Given that campaigning was suspended this is hardly surprising. Nor is it surprising that in a state of shock and heightened anxiety, voters will tend to be more inclined to support an incumbent government or, still more, to turn toward the party most traditionally trusted on law and order. 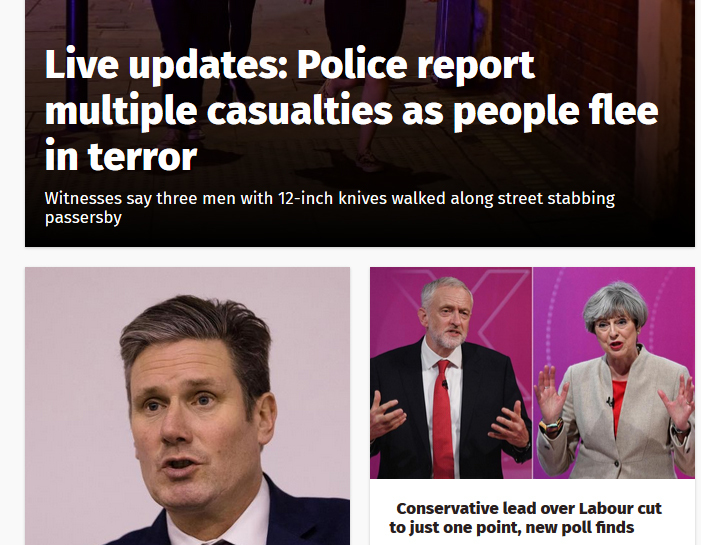 Yet the surge for Labour was only partially held back, and the pollsters were found wanting all over again – except for the exit poll, that is. The night before the election, with the polls which had certainly tightened still remaining wildly divergent, I decided to check out the odds at the bookies, given how bookies obviously have a vested interest in getting their numbers right. And a Tory majority then remained odds on, with many punters betting on who might be the next Labour leader. Although May’s position had become shaky too, the smart money was very much backing an increased Tory majority with gains of up to a hundred seats. My heart sank, just as it did immediately upon hearing May’s election announcement. Like many Labour supporters, I was still braced for a trouncing. Most polls are unreliable, but exit polls are different. They have a special legitimacy and have in some cases been applied as a standard of verification for elections across the world. Two years ago the exit poll had been a shattering blow. In the weeks leading up to the vote the opinion polls consistently pointed to a hung parliament, whereas the exit poll had quite correctly forecast a Tory majority. On this occasion I was anticipating the worst. Given the unbridgeable six point gap (and an enormous spread of polls between 1% and 15%) combined with the traditional last minute shift in favour of the Conservatives (the shy Tories emerging from their closets), damage limitation was all any Labour supporter could conceivably wish for. Not only the Tories, but every other mainland political party were about to be humiliated in their own special way. Ukip were rather predictably annihilated. Yet to think how a mere four months earlier, so many pundits had been licking their lips at the prospect of leader Paul Nuttall stealing Stoke-on-Trent Central in a by-election, and running Labour and Corbyn out of town. Now Nuttall was ruined instead. Meanwhile, the Lib Dems whose entire campaign was devoted to their bizarre since unrealisable promise of an EU referendum rerun, gained a measly four seats to prop up the meagre eight they already held. Former leader Nick Clegg who had helped the Tories remain in power during the miserable days of the Con-Dem Coalition lost his seat just up the road from me in Sheffield Hallam; like many across the country, I cheered his just demise. A few hours later, hopeless leader Tim Farron did the honourable thing. In my own constituency of Sheffield Central, former leader of the Greens, Natalie Bennett, came to contest what is a comparatively safe Labour seat, rather than more profitably fighting her corner in a Conservative marginal – so much for forming a “progressive alliance” against the government. Once again, justice was served and Bennett lost, finishing an embarrassing third behind the Tories, with incumbent Paul Blomfield swept back into parliament with a hugely increased majority now approaching 28,000. North of the border, the political landscape was being even more dramatically reshaped. After the Brexit vote, the SNP had been calling for a new independence referendum – a replay of that “once in a lifetime decision” barely more than two years on. But this divisive move soon became an albatross, and as the SNP tried to backslide on their promises and downplay calls for Indyref2, the Scottish Conservatives no less opportunistically cranked up the pro-unionist rhetoric (a flavour of things to come). It proved a winning tactic with many disaffected Scottish voters. ‘Theresa May and the Holy Grail’: having lost her majority, and with complicated Brexit negotiations and fields of wheat on her doorstep, Theresa May is determined to ‘get on with the job of government’ (and to seek the Holy Grail). Click here to watch the original upload at Australia’s ABC. A week prior to the general election I had a dream and woke with a vision of Jeremy Corbyn walking into Downing Street as Prime Minister. The dream genuinely happened, but then dreams are rarely prognostic. Instead, the Tories clung on as the main party of government, which is the very best they can say for themselves. May’s re-election was the very epitome of a Pyrrhic victory. Instead of the envisaged landslide, her government is suddenly in retreat, and clinging to power by its political fingertips, made all the grubbier by that desperate £1.5 billion deal with the political arm of Ulster’s loyalist paramilitaries. How long this weak and wobbly ‘coalition of chaos’ can hobble along together is anyone’s guess. More speculatively then, the dream seems to me prophetic in a truer sense of the word: that intuitively I was picking up on quite seismic upheavals that were very hard to comprehend, or even to register, during my various interactions on the doorstep. Thus, routinely faced with antipathy and aversion toward Corbyn’s leadership, a common reaction coming from many one-time Labour voters, it became easy to overlook the surge in Labour support from less expected quarters. This groundswell, as we now know, involved more than just an increased turnout of first-time voters, since it mostly comprised disaffected Lib Dems, wavering Greens, and, more interestingly, some half of former Ukip supporters, plus thousands returning from the SNP, and most surprising of all, a significant proportion of affluent middle-class who are traditionally Conservative supporters. In short, my dream had detected a sea change taking place in our society; shifts in outlook that Corbyn and others in the Labour leadership were directly responding to. Very skilfully, they had steered the whole debate away from Brexit (May’s original pretext for calling the election) and away from personality too (May’s team had embarked on a presidential-style campaign) by redirecting attention firmly back on to policy instead. In the manner of a musical maestro who responds to applause from his audience by holding up the score, Corbyn consistently drew the public gaze back to Labour’s bold and very thoughtfully composed manifesto: “For the many, not the few”. 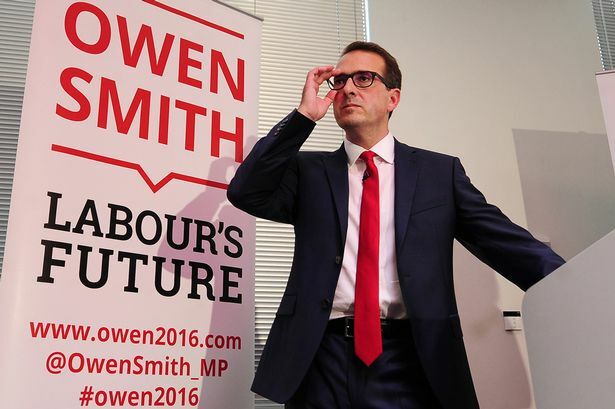 A manifesto launched not once but twice – funny that! Fully-costed, anti-austerity populism; this was certainly a masterstroke. Corbyn and McDonnell survived the election against all the odds, and having thus achieved a result beyond common expectation, they have managed to reunite the party behind a commitment to democratic socialist policies. These policies have become Labour’s main strength again. So although Corbyn didn’t win the vote, the Labour manifesto actually did, and as a direct consequence, temporarily at least, it has produced a measureable shift leftwards in the mythical ‘centre ground’ of politics. Those of us determined to say “enough is enough” now have a place to turn and a leader they can get behind. Remember those few days in June when Labour MPs couldn’t stop resigning? That long Sunday after the country had voted for Brexit, when every time you turned on the radio another shadow cabinet minister had stood down, calling for Jeremy Corbyn to do likewise? Or the next day, when the only thing you wanted to quit was the non-stop news, just for a few hours, but there was Angela Eagle in tears at her own resignation? Before June, the mass resignation of 44 frontbench politicians in as many hours, all citing a loss of confidence in their leader, would have led to said leader being turfed out of office. But we didn’t count on Corbyn. 8 Quip stolen from George Galloway. Ask yourself a simple, but serious, question. You go for a job interview. Which trait is most likely to work against you: if you’re ugly, if you’re fat, if you’re short, or if you’re Jewish? It’s perhaps a sad commentary on our society’s values, but the trait most likely to elicit a rejection letter is if you’re ugly. Then fat; then short. The factor least likely to work against you is, if you’re Jewish. says American Jewish scholar Norman Finkelstein. The question you have to ask yourself is, why? Why has this issue been resurrected with a vengeance, so soon after its previous outing was disposed of as a farce? Is it because of a handful of allegedly antisemitic social media postings from Labour members? Is it because of the tongue-in-cheek map posted by Naz Shah? That’s not believable. The only plausible answer is, it’s political. It has nothing whatsoever to do with the factual situation; instead, a few suspect cases of antisemitism – some real, some contrived – are being exploited for an ulterior political motive. As one senior Labour MP said the other day, it’s transparently a smear campaign. Finkelstein has chosen to break his silence on this latest pro-Israel witch hunt by giving an interview to Jamie Stern-Weiner. A transcript published May 3rd is available here. Labour has now set up an inquiry that is supposed to produce a workable definition of ‘antisemitism’ – which is to say, to achieve the impossible. It’s been tried countless times before, and it’s always proven futile. The only beneficiaries of such a mandate will be academic ‘specialists’ on antisemitism, who will receive hefty consultancy fees (I can already see Richard Evans at the head of the queue), and Israel, which will no longer be in the spotlight. I understand the short-term political rationale. But at some point, you have to say, ‘enough already’. Jews are prospering as never before in the UK. The polls show that the number of, so to speak, hard-core antisemites is miniscule. It’s time to put a stop to this periodic charade, because it ends up besmirching the victims of the Nazi holocaust, diverting from the real suffering of the Palestinian people, and poisoning relations between the Jewish and Muslim communities. You just had an antisemitism hysteria last year, and it was a farce. And now again? Another inquiry? Another investigation? No. In order to put an end to this, there has to be a decisive repudiation of this political blackmail. Bernie Sanders was brutally pressured to back down on his claim that Israel had used disproportionate force during its 2014 assault on Gaza. He wouldn’t budge, he wouldn’t retreat. He showed real backbone. Corbyn should take heart and inspiration from Bernie’s example. He has to say: no more reports, no more investigations, we’re not going there any more. The game is up. It’s long past time that these antisemitism-mongers crawled back into their sewer – but not before humbly apologising to Naz Shah, and begging her forgiveness. It is true that Bernie Sanders’ response is an exemplary one, but we should of course bear in mind that he is a Jewish candidate. This provides immunity (at least to some extent – though not entirely as we shall see) from spurious charges of antisemitism. Readers have expressed shock at the scandalous remarks attributed to Jonathan Freedland. Finkelstein decided to amend the paragraph so as to quote Freedland word-for-word. Readers will now perhaps be even more shocked. You can see this overlap between the Labour Right and pro-Israel groups personified in individuals like Jonathan Freedland, a Blairite hack who also regularly plays the antisemitism card. He’s combined these two hobbies to attack Corbyn. Incidentally, when my book, The Holocaust Industry, came out in 2000, Freedland wrote that I was ‘closer to the people who created the Holocaust than to those who suffered in it’. Although he appears to be, oh, so politically correct now, he didn’t find it inappropriate to suggest that I resembled the Nazis who gassed my family. We appeared on a television program together. Before the program, he approached me to shake my hand. When I refused, he reacted in stunned silence. Why wouldn’t I shake his hand? He couldn’t comprehend it. It tells you something about these dull-witted creeps. The smears, the slanders – for them, it’s all in a day’s work. Why should anyone get agitated? Later, on the program, it was pointed out that the Guardian, where he worked, had serialised The Holocaust Industry across two issues. He was asked by the presenter, if my book was the equivalent of Mein Kampf, would he resign from the paper? Of course not. Didn’t the presenter get that it’s all a game? Click here to read the full transcript of Finkelstein’s scathing rebuke of all accusations of latent racism within the Labour Party, including those levelled at Ken Livingstone. Naz Shah has been hung out to dry today. She has confessed, recanted and repented. Her shame is absolute. She has had the Labour Party whip withdrawn and people like the rapidly moving rightwards airhead, Owen Jones, was in the vanguard of the witch hunt calling for her suspension John McDonnell was right to swiftly force Naz Shah’s resignation – but now the party has to suspend her. All we need is the scaffold and then she could literally be hung out to dry. Indeed Naz Shah has confessed to her comments being anti-Semitic. Isn’t that enough proof? No. The defendants in the Stalin purge trials also confessed to being Trotsky’s agents and more. It is perfectly possible to create a psychological atmosphere such that people will confess to all manner of things, even though they are not guilty. Police interrogators have, throughout the years, been quite skilled in obtaining false confessions without the need to beat people up or torture them. So let me say it here – there is nothing anti-Semitic in what Naz Shah has said. She made what was quite a flippant humorous joke in the midst of something that was anything but funny – the merciless use of American planes, white phosphorous and the most modern missiles and rocket technology against a people who had nothing except pea crackers to fire back with (the ‘rockets’ that Israel used as a pretext for the bombardment and invasion). Let us not forget that 2,200 people were murdered in Gaza including 551 ‘terrorist’ children. The anti-Semitism talked about today is nothing more than an attempt to defend Israel. It has nothing to do with actual anti-Semitism. Zionists (no it’s not a term of abuse it means those who defend the State of Israel – they do after all have a World Zionist Organisation) find it difficult to defend incarceration and torture of children as young as 12 (if they are Palestinian). Jewish children of course can’t be locked up unless they are at least 14 and they have social workers and parents accompanying them unlike Palestinian children who are kept in solitary confinement, beaten and worse. It is difficult defending a system where 93% of Israeli land is reserved wholly for Jewish use. It is much better to cry ‘anti-Semitism’ and attack the messenger rather than the message. What is happening is that the millions of pounds that the Israeli government has devoted to propaganda is being spent now to destabilise Jeremy Corbyn and the new Labour leadership. They are hunting down every tweet, email etc. in order to create an atmosphere of permanent instability. I know because tweets I have issued have been taken totally out of context to suggest I am anti-Semitic. If someone calls me a ‘self-hater’ ‘anti-Semite’ etc. I will accuse them of being ‘zio scum’ or whatever. Anti-Semitic? Get a life. As the witch hunt gathered pace, the Jewish Socialists’ Group issued a formal statement. Thanks to social networking forums it quickly gathered a sizeable audience across the internet. However the corporate media turned an immediate blind eye instead. Opponents of Jeremy Corbyn within the Labour party. Back in March, as the current witch hunt was just brewing, I posted an extended article entitled “anti-Zionism ≠ antisemitism: playing the race card cannot diguise Israel’s guilt”. As an epigraph, I quoted a dictionary definition of the word ‘racism’. My idea was to encourage readers to reflect on the strict meaning of the word so as to reach an appreciation that this has significantly drifted and, more importantly, been diluted. On reflection the use of such a device was gauche and may have appeared sententious, although in light of what has since transpired my concern was surely a justifiable one. Indeed, the need to reclaim the word ‘racism’ is becoming an urgent one. Casually brandished by those whose sole purpose is to blacken the name of their opponents, its proper meaning is cheapened. This is an exceedingly dangerous game. For words very often act as safeguards against the gravest of our errors: ‘racism’ serves as just such a safeguard. We undermine its correct meaning at our collective peril. Jackie Walker, Vice Chair of the grassroots movement Momentum that helped Jeremy Corbyn become party leader, is another Labour activist who was suspended over alleged antisemitic comments posted on social media. Little more than one year ago, the West was poised to launch air strikes against Syria. Under the pretext that Assad had crossed Obama’s “red line” (a charge that has since been challenged on the basis of evidence uncovered by respected journalist Seymour Hersh and others – follow the tag on “Ghouta” to read more details) we were then about to be rushed headlong into a war that would have greatly strengthened the hand of “the rebels”, already known to be comprised mostly of al-Qaeda factions (again, you can find evidence for this in many earlier articles posted under the categories “Syria” or “al-Qaeda”). Incredibly, we are now poised to launch a different military offensive, this time against the “rebels” we had previously been supporting, but since renamed ISIS, ISIL and IS (for added confusion). To compound the absurdity in a speech made at the UN General Assembly, Obama now talks of a “war on war” for a peaceful future! Along with most British people, we opposed an attack on Iraq in 2003. The brutal reality of the invasion and occupation confirmed our worst fears. At least half a million died and the country was devastated. Now, less than three years after US troops were pulled out, the US is bombing again. The British government is considering joining military action, not just in Iraq but in Syria too. All the experience of the varied military action taken by the west in Afghanistan, Iraq and Libya shows that such interventions kill innocents, destroy infrastructure and fragment societies, and in the process spread bitterness and violence. While we all reject the politics and methods of Isis, we have to recognise that it is in part a product of the last disastrous intervention, which helped foster sectarianism and regional division. It has also been funded and aided by some of the west’s allies, especially Saudi Arabia. More bombing, let alone boots on the ground, will only exacerbate the situation. We urge the government to rule out any further military action in Iraq or Syria. Lindsey German, convenor of the Stop the War Coalition, Caryl Churchill, playwright Brian Eno, musician Tariq Ali, writer and broadcaster Jeremy Corbyn MP Diane Abbott MP Ken Loach, film director Michael Rosen, author and broadcaster Kate Hudson, general secretary of CND John McDonnell MP Sami Ramadani, Iraqi writer and campaigner Caroline Lucas MP Nick Broomfield, filmmaker Len McCluskey, general secretary of Unite Amir Amarani, film director Mark Rylance, actor Mohammed Kozbar, vice president of the Muslim Association of Britain Dr Anas Altikriti Baroness Jenny Tonge Andrew Murray, chief of staff Unite Jean Urquhart MSP Walter Wolfgang, Labour CND. If you haven’t already, lobby your MP now. It takes two minutes. Participate in the debate by phoning local radio stations. The topic of bombing Iraq and Syria is bound to loom large this week, especially in radio prime time (around 8-9 am and 5-6 pm). LBC (Leading Britain’s Conversation) is a prominent example of a talk radio station (97.3 FM, its telephone number is 0345 60 60 973). BBC Radio 5 Live (AM: 693 kHz, 909 kHz, 990 kHz ) is another major national talk radio station. Its telephone number is 0500 909693. For a list of local BBC radio stations, click here.